Remove the skin from your salmon fillet. Slice the salmon 3-4mm thick – you will need 8 slices per serving, 32 in total. Mix the soya sauce, sweet chilli sauce, honey and the juice of the lime. Season with salt. Cover the salmon with the dressing and leave to stand for 3-4 minutes. Thinly slice the fennel – keep some of the leaves for garnish. Arrange the salmon on a clean plate. Place the sliced radish, sliced fennel and fennel leaves on the salmon. Zest some of the lime over the dish. Garnish with the coriander cress. Thinly slice the spring onion. Add the spring onion to the plate. Dress the dish with the remainder of the Soy and Chilli dressing. Delicately sprinkle on the olive oil pearls. 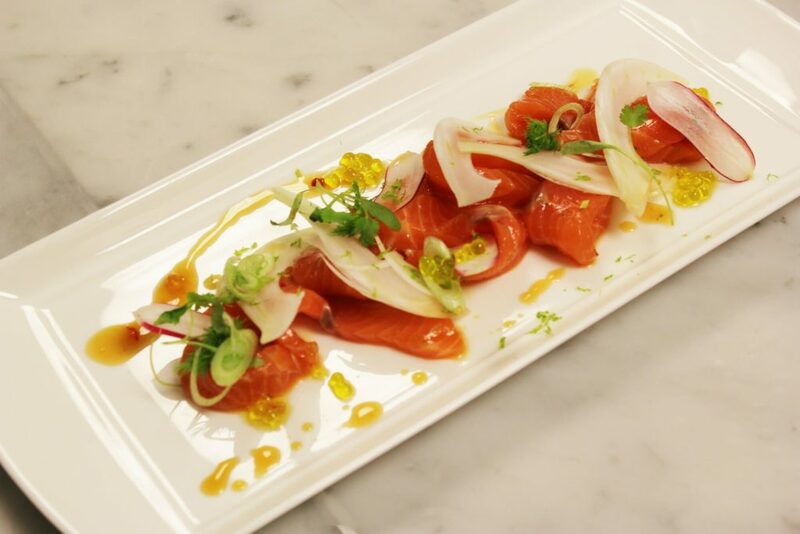 Your Loch Duart Salmon Ceviche with Soy and Chilli dressing is ready to be served.